Customer Experience, Esendex, Esendex Live! Great customer experience is something that is expected. During all stages of a consumer’s interaction with a business, they expect a seamless flow that allows them to complete their desired action without putting them under extra stress or strain. Unfortunately, this isn’t always the case, with instances of a bad customer experience still being seen, meaning businesses losing customers as they switch to a competitor. We had two stories from our team members here at Esendex, both about an experience they had with a business. One of these stories was of a great experience that took them through a buying process with ease, they were extremely impressed by this and advocated the business to everyone they spoke to. The other story, however, was quite the opposite, with a very long and frustrating process that left them feeling deflated and unimpressed, meaning they were talking negatively about that business. Both stories really hit home hard. Both great and bad experiences will be shared and talked about, we wanted to base our latest Esendex Live event around this; how great customer experience can really add value to a business. 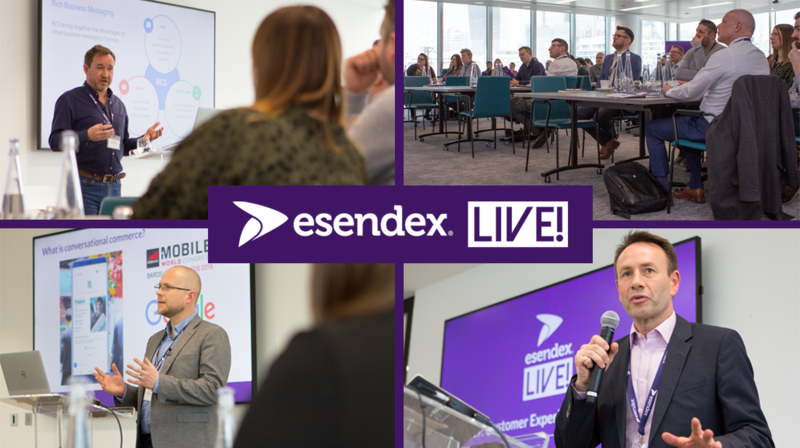 On the 19th of March 2019, we held our biggest ever Esendex Live event in London. The aim was to showcase what a great customer experience looked like and how using digital channels, businesses could deliver this world-class customer experience that consumers expect. The day involved talks from 3 of our customers showcasing how they are already providing a great customer experience, a presentation from Google that took us for an inside look into their business, and finishing with 3 presentations on how Esendex can help to provide a long-lasting and world class customer experience through some of our products and solutions. First up was Scottish and Southern Electricity Networks who talked about the art of creating a memorable customer experience in digital. The presentation took attendees through some simple yet effective steps they could take to enable them to provide a memorable experience for customers on digital channels. Next Link Financial spoke about how they were providing customers with their preferred channels using Esendex products. The presentation looked at enhancing Customer Preferred Channels in partnership with Esendex. Our final talk was from OpenWrks who spoke about turning a bad situation into a good customer experience. Olly shared his thoughts and learnings on whether the usual customer experience best practices apply. After a short break, Tim Atkinson from Google took us inside Google with a look at RCS and rich business messaging. There was huge excitement and buzz around RCS and what it could deliver for not only customers as the end user, but also businesses like yours during his talk. With RCS helping to deliver an exceptional mobile experience like none other, incredible functionality, increased engagement and much-improved conversions. We finished the day with 3 short presentations on how Esendex can help businesses provide a fantastic customer experience using digital channels. Andrew Kirkland showcased one of Esendex’s new products, Messaging Studio, and how SMS has evolved to become a richer communication channel. Michael Power then took us through conversational commerce and how SMS messaging is changing from a one-way communication channel, that with the power of RCS, it can be a more engaging experience for customers. Adam Rathbone finished the talks by taking everyone through a journey from our newest product, Mobile Collect. This is a solution that provides businesses with an easy and effective way to collect low-value debt. This concluded an outstanding Esendex Live event and we would like to thank everyone who attended. If you are interested in coming to future Esendex Live events, please keep an eye out on our social media pages and website.